An on-site in-service may be pre-scheduled for education in a variety of medical settings. A clinician experienced in the use of the Passy Muir Valve will provide information related to the physiologic changes that may occur following the placement of a tracheostomy tube. Evidence-based benefits of using a bias-closed, no-leak speaking valve, Including the impact on voicing, swallowing, secretion management, and reducing decannulation time will be presented. Upper airway assessment, transitioning and troubleshooting strategies and ways to increase Valve wear time will be discussed and demonstrated using a Tracheostomy T.O.M®. Model. For those clinicians and facilities who are interested in increasing Valve use through ventilator application of the Passy Muir Valve or developing a multi-disciplinary team, a presentation may be scheduled that includes demonstration and hands-on training for in-line application with mechanical ventilation. 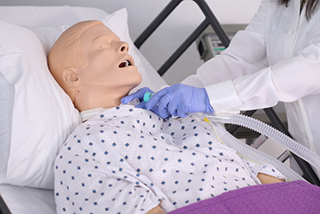 During this in-service, a Ventilator Instruction Teaching and Observation mannequin (also known as VITO) may be connected to one of the facility’s ventilators to demonstrate the principles of in-line valve assessment and application, including ventilator adjustments to increase successful placement of the Valve and safe alarm practices. After the presentation, we also may provide additional instruction at the bedside of patients appropriate for a Passy Muir® Valve assessment and placement, if requested. Our clinicians have found that this bedside coaching has been helpful, especially for those who are attempting ventilator application for the first time. It went extremely well and the pulmonologists were extremely enthusiastic regarding getting the PMSV in-line with vent earlier in our acute care setting. I think we sparked a huge MD interest to improve on the care we provide, which is fantastic. We are using the valves extensively… and have had great success using it in-line. In fact, one patient just spoke for the ﬁrst time in TWO YEARS! The speech therapist and CNAs were actually standing around the patient crying with joy when she successfully spoke. It’s amazing how being able to speak again can make a patient feel more like a person again, and facilitate the weaning process. Please contact a Passy Muir clinical specialist to discuss the specific needs of your facility and to schedule on-site education.